Krispy Kreme is introducing a refreshingly cool new way to enjoy its great-tasting coffee. Featuring a smooth blend of premium espresso and real cream, Krispy Kreme(R) Frozen Lattes are available in three great-tasting flavors. 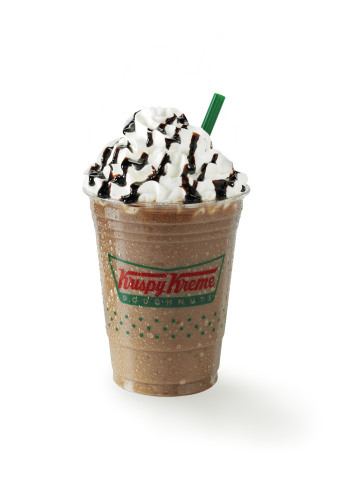 Krispy Kreme Frozen Mocha, Frozen Vanilla Latte and Frozen Caramel Latte are made fresh to order at participating Krispy Kreme US locations. oNEW Frozen Mocha – A decadent blend of chocolate, espresso, real cream and ice, topped with whipped cream and a chocolate drizzle. oNEW Frozen Vanilla Latte - An icy blend of real cream, vanilla and espresso topped with whipped cream. oNEW Frozen Caramel Latte – Caramel and espresso, blended with ice and real cream, topped with whipped cream and a caramel drizzle. Krispy Kreme is an international retailer of premium-quality sweet treats, including its signature Original Glazed(R) doughnut. Headquartered in Winston-Salem, N.C., the Company has offered the highest-quality doughnuts and great-tasting coffee since it was founded in 1937. Krispy Kreme is proud of its Fundraising program, which for decades has helped non-profit organizations raise millions of dollars in needed funds. Today, Krispy Kreme can be found in over 1000 locations in more than 20 countries around the world. Krispy Kreme is listed on the New York Stock Exchange (NYSE:KKD) . Visit us at www.KrispyKreme.com.